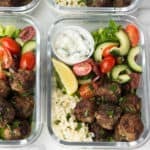 These meal prep Whole30 Greek Lamb Meatball Bowls are packed with protein, veggies, and healthy fats, AND a homemade tzatziki sauce for dipping! 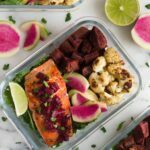 An easy and healthy meal to help keep you on track and makes great for meal prep throughout the week. 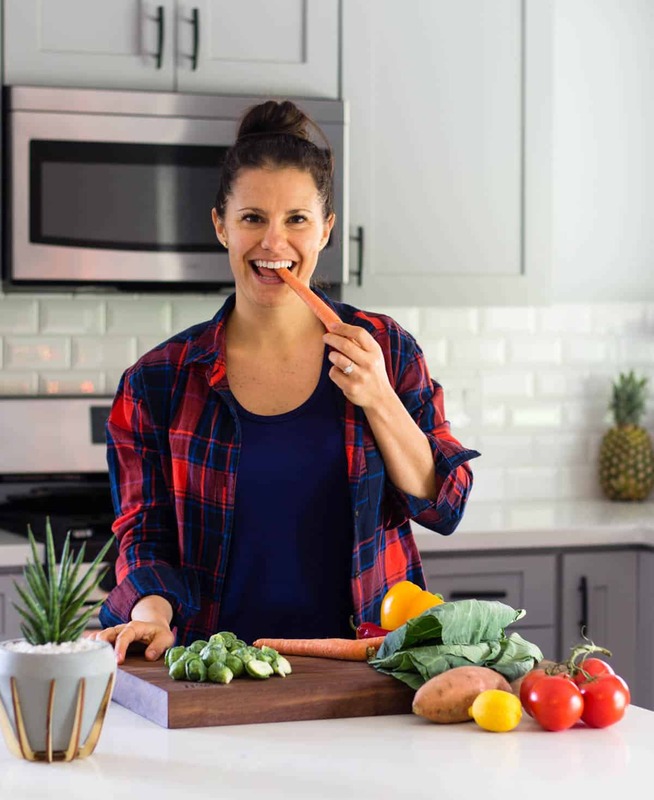 This recipe first appeared on Instagram in partnership with Atkins Ranch. 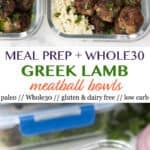 Following up yesterday’s tzatziki sauce with the most epic meal prep meal – Whole30 greek lamb meatball bowls!! I posted this recipe for the meatballs on Instagram awhile back and knew I needed to share them on the blog. Since Greek food is one of my favorites, I took all those flavors and turned it into an easy meal for the week. How do you feel about lamb? I love it, but don’t eat it that often. I love getting it when I’m out to dinner (especially at a Greek restaurants), but it’s not something I usually buy to bring home for some reason. It just doesn’t cross my mind at the grocery store. 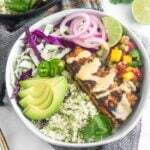 Not only is it delicious, but it is packed with protein, iron, zinc, vitamin B12, and has lots of those heart healthy omega 3s. If you feel intimidated by it, don’t be! Especially ground lamb – you can treat it like ground beef for the most part. After doing some research, traditional Greek meatballs can be loaded with lots of extra fillers – from breadcrumbs to even soaked bread. They are usually rolled in flour and pan fried as well. 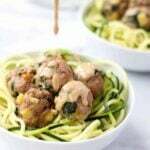 I wanted to keep these meatballs as close to traditional as I could, so I did a few simple substitutions to keep make gluten free and Whole30 approved without sacrificing the flavor. Win win! I served them over some chopped romaine and paired them with cauliflower rice, an easy Greek salad, and homemade tzatziki sauce for dipping (because you need a sauce with meatballs). I like to make a batch on Sunday and use them for meal prep throughout the week as they keep and hold up well. Just keep the tzatziki in a separate container or dish until you are ready to eat. In a large bowl, mix all meatballs ingredients today (except tapioca flour and oil for frying). Cover and place in the fridge for at least an hour to let flavors marinate. While the meatballs marinate, make the greek salad. Combine all ingredients into a medium bowl and stir to combine. If making tzatziki or cauliflower rice, make those as well. 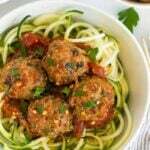 After they marinate, use a tablespoon as a scoop to form into meatballs. Add flour into a small bowl and roll each meatball in the flour, making sure it is coated, but shaking off the excess. Heat a well seasoned cast iron over medium heat. Add oil if needed. Cook meatballs for 5-7 minutes, stirring occasionally, until golden brown and cooked through (you will probably have to do in a couple batches). Serve with greek salad, cauliflower rice, and homemade tzatziki! Enjoy! I made these for meal prep this week. They were so full of flavor. I will definitely be making again. Loved the tzatziki too!! Yay! So glad you liked them Lisa! They are one of my favorites – thanks for trying! So good and so easy! Meal prepped these bad boys for Greek salad bowls for the week over kale! Woot woot! So glad you liked them Katie!! Thanks for trying!